The site of the former Reinhard School in Hellertown is now a vacant field at Northampton Street and Magnolia Road. 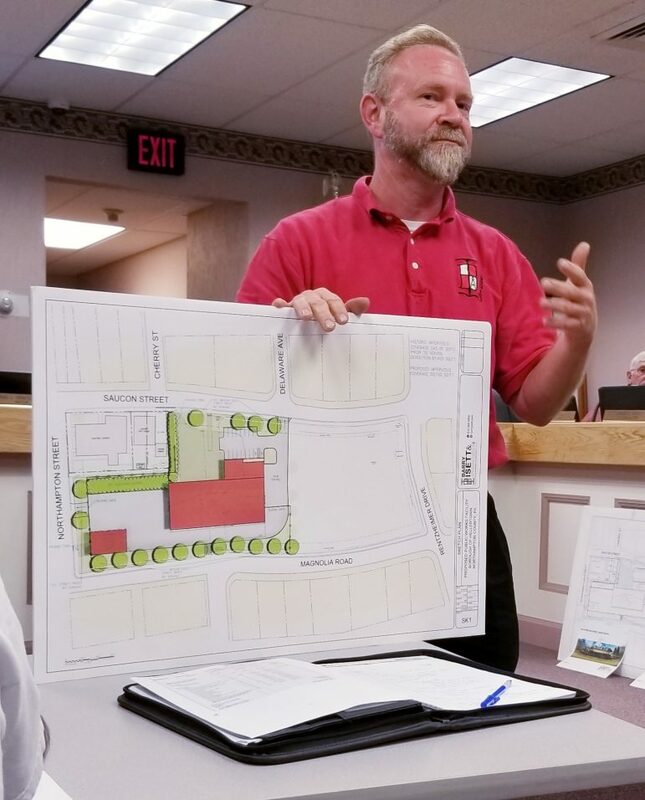 A number of residents of Magnolia Road, Saucon Street and other primarily residential streets near the former Reinhard School in Hellertown attended a council meeting Monday to share their concerns about a proposal to construct a new public works building on that site. 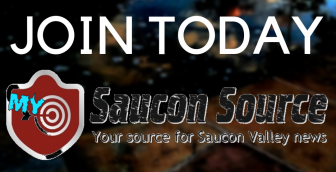 The primary concerns shared involve quality of life and property values. “The project as we see it is ill-conceived, risky and hastily composed,” said Carol Savitske, who told council she and her family have lived on Delaware Avenue near the proposed building site for more than 40 years. 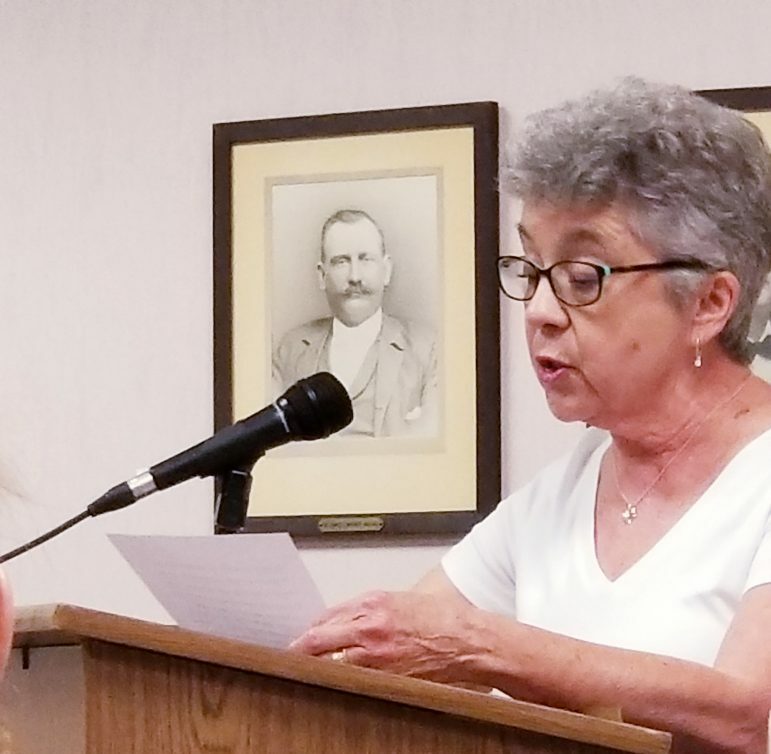 Delaware Avenue resident Carol Savitske addresses Hellertown Borough Council Monday night. East Saucon Street resident Bill Broun told council he is concerned that the quiet, family-oriented character of his neighborhood will forever be changed by the construction of a 17,000 square-foot public works building with a driveway exit onto Saucon Street, and the resulting increase in truck traffic and noise along the street, where he said children frequently play. East Saucon Street resident Bill Broun reads a prepared statement about his opposition to a conceptual proposal for a public works building on the site of the former Reinhard School at Monday’s Hellertown Borough Council meeting. 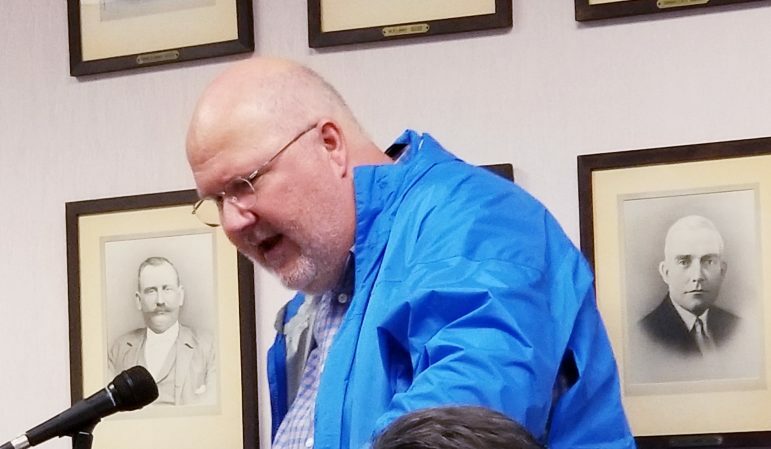 Council president Tom Rieger attempted to refute that statement and others with a historical outline of the borough’s ownership of the Reinhard School property that he presented. Hellertown Borough Council President Tom Rieger (center), Mayor David Heintzelman (left) and borough Solicitor Michael Corriere (right) listen to attendees speak about a conceptual proposal for a new public works building at Monday’s borough council meeting. He noted that discussions about expanding Hellertown’s municipal complex date back to the 1960s, and that the borough’s ownership of the land and the former school dates to the early 2000s, when it purchased the property from the Saucon Valley School District for $1 with a deed restriction requiring that it only ever be used for municipal purposes. At the time, Rieger said, it was hoped that the 1910 school building could be renovated, but because of deterioration and for other reasons that proved unfeasible. Underground fuel tanks on the site were removed in 2009 and asbestos in the 1950s-era addition to Reinhard School was removed shortly thereafter. The three-story stucco building was finally razed in early 2012 and ever since then the lot on which it sat has been vacant, although it is used for passive recreational purposes by neighborhood and borough residents. Rieger said the borough had hoped to begin repurposing the property to suit its needs as early as 15 years ago, but that damage to other borough infrastructure wrought by Hurricane Floyd in September 2004 forced those plans to be placed on the back burner for a number of years. In 2012 the borough began a capital projects planning phase which so far has funded projects such as bridge replacements and a new swimming pool liner, and in 2014 the borough commissioned a space needs study that was completed by its engineering firm of Barry Isett & Associates. Borough engineer Bryan Smith of Barry Isett and Associates discusses the concept proposal for a new public works building at Monday night’s borough council meeting. He said the building would be surrounded by new landscaping to include a “heavy buffer” from Saucon Street to Northampton Street. There would also be a parking area for employees, and room for the future construction of a smaller garage building at Magnolia Road and Northampton Street, Smith said. He added that the building would essentially occupy the footprint of the former school, which was demolished in 2012. In early 2017, Rieger said, as a result of that study’s conclusions, the borough began looking for properties to purchase because there is now a critical lack of space in the municipal complex. Under the Borough Code, discussion about this serach was excluded from public meetings, he noted. A number of parcels were examined, but some–like land that is located near the grist mill–cannot be developed because it was purchased with federal funds in the 1970s and the stipulation that it remain open, public space. Another property wasn’t appropriate because it is located outside of the borough, and two more parcels were too expensive, Rieger said. That left the Reinhard property as the primary site contender for the expansion of the public works department, which will take it out of the 1942 “stables” building behind Borough Hall so the police department can use it. A conceptual plan that was presented at a special Sept. 11 borough council meeting advertised Sept. 8 in the legal notices section of the Morning Call and under “News” on the borough’s website needed to be presented when it was so the borough can begin applying for grants that could help pay for the building, Rieger explained to more than a dozen neighborhood residents, some of whom said they felt blindsided by the lack of notification about the proposal. “The conceptual plan was presented last week,” Rieger told them, because “we have pending grant applications we want to file,” including one that’s due Sept. 30. A municipal use is “the original intended use for that property” and the borough is under “no deadline” to develop it, he emphasized. 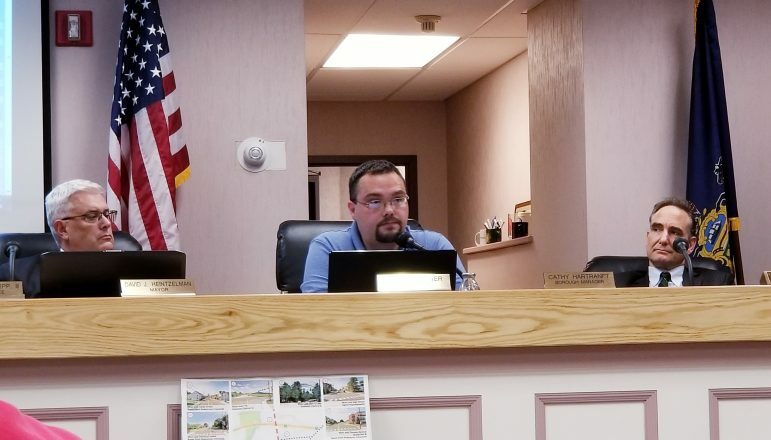 Several council members–including Rieger–said they were hurt and taken aback that residents were implying that because no one from council lives in the immediate area of the proposed public works building, they are unsympathetic to the impact it could have on the neighborhood. “I care dearly about this community,” councilman Kevin Lott said. “Our police force is not up to current regulations” and if something isn’t done, sooner or later the state will come in, force them to make physical changes to the department and borough “taxes will go through the roof,” he predicted. Rieger said that just because he lives in one part of the borough doesn’t mean that he doesn’t care about all of the other neighborhoods. 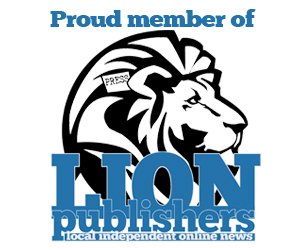 “The primary use of the borough (public works) equipment is primarily pickup trucks and lawn tractors,” Rieger said. The big trucks the department maintains are really only used for snow events and leaf pickup, he said, and the borough’s salt shed and garbage trucks are stored by the grist mill, where they will remain. Only one person spoke in favor of the proposal. Casey Koch, of Willow Road, said he is a borough public works department employee. After some discussion council voted 7-0 to approve the conceptual plan, which has a projected cost of anywhere from $800,000 to $2.2 million, depending on how much of the work on the project is performed by public works employees and the number and amount of grants received, if any. Council also unanimously approved the symbolic allocation of $500,000 from its undesignated fund balance in support of the project, which Rieger said will help with applying for grants, by demonstrating the borough’s seriousness about the project.